Jenni can supply you with tools and equipment for rag rug making. You can also purchase kits and signed books. These items are available at Jenni’s workshops, or email for mail order and more details. A pine frame with webbing attached and bolts is also available. Equipment prices from £4.25 to £75 plus postage & packing – email for details. Progged seat pad. Kit contains backing with design for 39cm dia. spiral, instructions, bodger rug tool. Add fabric of your choice. Progged rag rug 75 x 50cms. Kit contains backing marked with traditional central diamond design, bodger tool & instructions. Just add fabric. Progged rag rug 41cm x 60cm. Kit contains hessian marked with geometric design, bodger tool, instructions.Add fabric. Oval Rag Rug 70x54cm. Kit contains hessian marked with oval design, bodger rug tool, full instructions. Hooked Terrier mat 59cm x 43cm (23x17in.) Kit contains hook, frame, backing with design and instructions. Use own fabric and/or yarn. Use frame to hook your own designs later. More Rag Rugs & Recycled Textile Projects (2011 Traplet Publications) This book has all the basics in the first book plus 10 new projects (including a peg loom project) and many new and vintage rug pics, plus more shared memories from bygone rug making days. Get a signed copy for £10 + £2.50 p&p. To order email jenni. Where can I get the speed shuttle hook? hi. what would it cost in dollars to buy your DVD and ship it to USA? Thank you. Traplet is out of business. are there any other American distributors for the DVD? 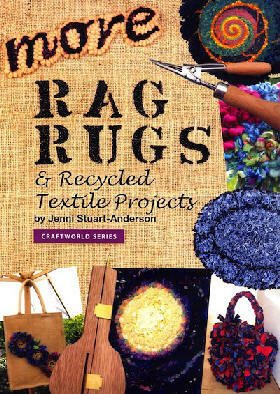 I have copies of the DVD and my second book More Rag Rugs. The DVD is £8 GBP plus postage. I have emailed you with more information. Hi, what price are your speed shuttles? a shuttle is currently £44 plus £4 signed for UK postage. where can i find a bodger? I don’t think Rigby is online. I have written in the past and if you ask for a leaflet with current prices, you should get one. Are you in the UK? Customs add on tax and handling fee. Cilla Cameron runs a private group called Buying and Selling Rug Hooking Equipment. You could ask her too.I have also put this in an email to you. I sell bodgers. Please email me for details. I am looking for a Rigby Cloth Stripping Machine……..can you help me……. ?